For a knockout-meets-stylish outfit, rock a tan trenchcoat with black leather skinny pants — these two items go beautifully together. When it comes to shoes, this outfit is round off nicely with Maison Margiela cut out heel pumps. Opt for a red tuxedo dress to look truly gorgeous. Make black leather pumps your footwear choice to loosen things up. If you're on the hunt for a casual yet chic getup, pair a burgundy blazer with burgundy dress pants. Both garments are totally comfy and will look fabulous together. When it comes to shoes, this look is round off wonderfully with Maison Margiela cut out heel pumps. If you're looking for a casual yet totally stylish outfit, opt for a white lace cropped top and a black and white lace pencil skirt. Both garments are totally comfy and will look fabulous together. 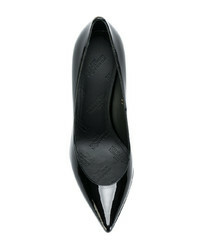 Maison Margiela cut out heel pumps from farfetch.com will instantly elevate even the laziest of looks. 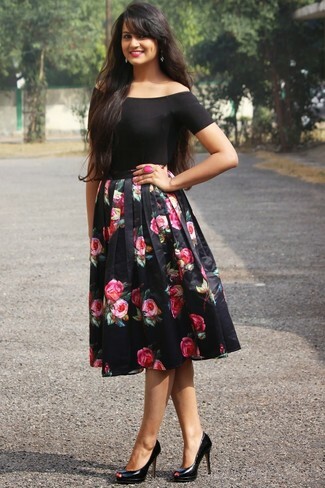 If you're all about relaxed dressing when it comes to fashion, you'll love this totally stylish pairing of a black off shoulder top and a black floral full skirt. Kick up the cool of your look by completing it with black leather pumps. If you're all about feeling relaxed when it comes to dressing up, this combination of a black short sleeve sweater and light blue ripped boyfriend jeans is just for you. You could perhaps get a little creative when it comes to footwear and spruce up your getup with Maison Margiela cut out heel pumps from farfetch.com. If it's comfort and ease that you're looking for in an outfit, team a grey coat with white jeans. When it comes to footwear, this ensemble is round off nicely with black leather pumps. For a killer-meets-stylish getup, rock a green trenchcoat with a navy and white floral pencil skirt — these items play really well together. When it comes to footwear, this getup is complemented nicely with Maison Margiela cut out heel pumps. If you're after a casual yet totally stylish outfit, consider teaming a beige sleeveless coat with navy ripped skinny jeans. Both items are totally comfy and will look fabulous paired together. Rocking a pair of Maison Margiela cut out heel pumps is an easy way to add extra flair to your outfit.